due date of 14-01-2019. Selection Process will be based on Physical Standards test, Physical Efficiency Test (PET), Written Test, Trade test or Skill Test. 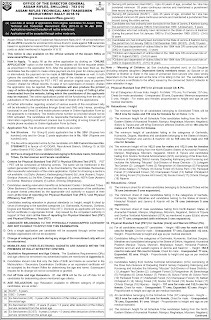 All details of Assam Rifles Recruitment Rally for Staff Nurse, GD, Cook, Clerk, Pharmacist, Lineman, Personal Assistant 705 Govt Jobs mentioned below. 1. Candidates may send Application forms to Head Office of Assam Rifles on or before due date of 04th February, 2017. 2. Closing date to send Application forms for hill area 20th February, 2017. 3. 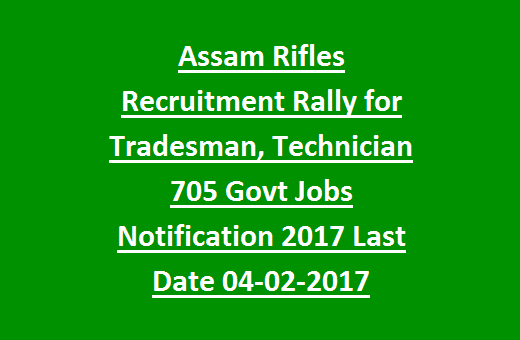 Assam Rifles Recruitment Rally will be held from 01st March, 2017. 4. Issue of Assam Rifles Admit Card will be notified soon. 5. Tentative Assam Rifles Written Exam date will be updated soon. 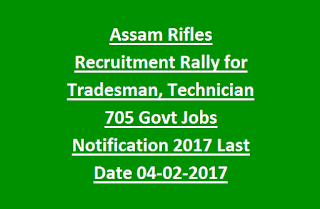 Assam Rifles has released total 705 Jobs. Candidates age Limit must in between 18 years to 28 years as on 01st January, 2017. There is a relaxation in age limit up to 5 years for Scheduled caste, Scheduled tribe category candidates; 3 years for Other Backward Classes (OBC), Ex-Serviceman candidates. 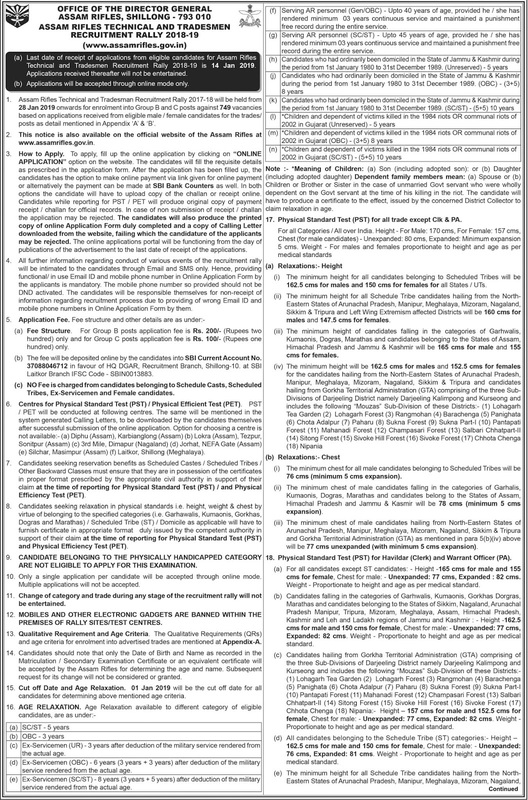 To get Educational Qualification details for these Staff Nurse, GD, Cook, Clerk, Pharmacist, Lineman, Tradesman, Technician etc Jobs, candidates please go through Official Notification. Selected candidates will get the pay Scale as per rules of central Govt Pay Scale. Selection Process will be based on Physical Standards test, Physical Efficiency Test (PET), Written Test, Trade test or Skill Test. Written test is for 100 marks with total 150 questions and time duration is 3 hours. Topics are Mathematics, General English, Reasoning/Aptitute and General Knowledge. * Male Candidates 5 km running within 24 Minutes. * Female candidates 1.6 km running within 8.30 minutes. Trade test is for tradesman jobs and skill test is for Clerk and Personal Assistant Jobs only. Application Fee for all category candidates is Rs.50/- (Fifty rupees Only) and bank charges Rs.25/- only. Interested and eligible candidates may send Application forms to Head Office of Assam Rifles on or before due date of 04th February, 2017. Laitkor, Shillong, Meghalaya, PIN - 793 010.